The Western Electric 60 AP Selector is a sort of all-mechanical intelligent relay, one which will only open when it receives a particular coded sequence of pulses. Used as the heart of many railroad and industrial phone switching systems in the early part of the 20th century, the core of the device is a rotating circular wheel with 17 holes around its edge. The wheel rotates a fixed number of degrees every time a pulse passes through the coil armature and is restrained by springs such that when power is removed from the coils, the wheel will snap back to its original position. A restraining arm lines up with the wheel along the holes in it's edge; pins placed in these holes that line up with the restraining arm when power is removed will hold the wheel in place, preventing the springs from snapping it back to home position. By placing pins into the various positions along the wheel a series of numbers can be encoded into the device, a matching set of pulses will cause the wheel to rotate through its full range and close a pair of contacts. It should be noted that a limitation of this device is that it can only be encoded with a series of numbers that totals up to 17, the number of pulses needed to rotate the wheel to its final position. Back in the time before iPhones, or any phone, messages were sent over long distances using Morse code and telegraph sounders, which tap out a "binary" stream of data that is sent electrically over a wire. 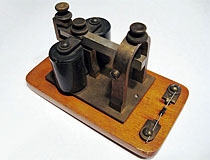 This telegraph sounder, made by the J.H. Bunnel company (not to be confused with the distressingly similarly-named Bunnell Telegraph company), is a fairly typical example of such a device. A pair of 50 ohm coils moves the main lever, which is mounted in a 'U'-shaped frame. Three thumbscrews with locking nuts adjust the travel of the main lever and the tension of the lever spring. Note that the diode bridging the two contacts in the photo is not part of the original device; but is a modern addition designed to protect solid state signal sources from damage by inductive kickback from the coils. The Gardinier papertape keyer is designed to read Morse code off of a series of holes punched in a roll of double-sided paper tape, and transmit the data down a pair of wires. 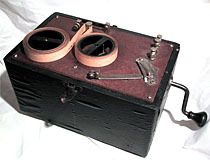 Since this device uses papertape that is almost identical to that of the Instructograph (pictured below), it was probably intended to be used as a Morse code practice device instead of for transmitting Morse code messages to far-off places. The papertape is fed by an electric motor, and a small knurled knob on the front of the machine can be turned to control the speed. There is also a small plastic lever in the contact gap at the top of the machine that can be used to adjust the gap's width. At this time, this unit has not yet been restored and has never been powered up. The Instructograph is designed for teaching Morse code, and includes coursework in the form of double-sided punched papertape reels. The reels are fed through a set of contacts, which are connected to binding posts where the user can connect a code oscillator or similar device. The motive power to pull the reels through the contacts is provided by a clockwork mechanism. There is a large crank on the side of the device to wind the machine, as well as a speed control lever on the top, which allows the user to select a narrow range of speeds for the device. The speed control is hooked up to a governor, similar to the kind used in rotary phone dials. The contact gap at the point where the papertape is read is adjustable by means of a small thumbscrew. While we normally don't cover consumer technology, sometimes we encounter something so bizarre or unusual that it practically demands documentation. This handheld cassette recorder, produced by EROs in the late 1970s, would be mundane if not for it's singularly hideous external appearance. This tape player is encrusted with fake gold and decorative fragments on almost every surface, so much so that it would not look out of place on the set of a James Bond flick. Even the buttons are covered in a fake gold coating. The features of this tape recorder are otherwise fairly mundane, though it does include a mechanical tape counter as well as a small analog meter to display battery level. A removable foot pedal allows the tape to be stopped and started hands-free, to aid in transcribing dictation. 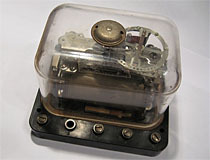 This tape recorder also comes with an unusual attachment; a ring-shaped pickup which is designed to be attached around the earpiece of a Western Electric rotary telephone. With the pickup in place, both sides of a phone conversation can be recorded. Even Goldfinger needs to maintain records of his business transactions. 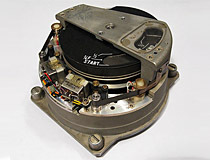 Many aircraft cockpit voice recorders had removable magazines such as this one for the storage of voice data. This recording magazine contains a spool of magnetic Mylar tape for the storage of voice data, much like the magnetic tape used in a consumer-grade cassette tape player. 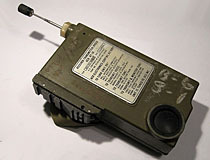 Unlike a conventional cassette player, the recording heads for this device are mounted within the magazine itself instead of the recorder, which prevents the tape from being exposed to dust and debris during installation and removal. 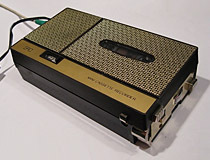 The magazine contains two heads to double the capacity of the tape: one is used when the tape is running clockwise, and the other is used when the tape is running counterclockwise. 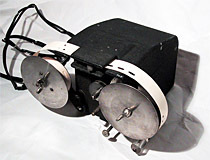 The two reels of the tape are stacked one on top of the other to reduce space, a system of gears and springs controls the tension between the two reels as the direction of rotation changes. A small window on the top of the magazine allows the level of tape remaining to be seen without removing the cover.